Coming out of college, where he had been an All-American at Alabama, there were questions as to whether Hutson was suited to the pro game. He quickly allayed such concerns as a rookie in 1935, catching 18 passes for 420 yards (23.3 avg.) and 6 TDs (he led the league with a total of 7). The numbers improved dramatically as he became the top receiver in the NFL, leading the league in receptions (34), yards (536), and TDs (8) in 1936 and receptions (41) and TDs (7) in ’37. Fast and innovative in the maneuvers he utilized and routes he ran, Hutson became the first deep threat and caused defenses to utilize new strategies, such as double- and triple-teaming, to contain him. He led the NFL in receiving yards (548) as well as TDs (9) in 1938 and in receptions (34), yards (849), and yards per catch (24.9) in ’39. 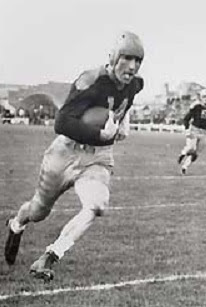 While he didn’t lead the league in receptions in 1940, he still had a then-career high with 45, and in 1941 he was first awarded the Joe F. Carr trophy as league MVP after tying the NFL record for catches (58) and also leading in yards (738), scoring (95 points), and touchdowns (12, tied with George McAfee of the Bears). Packers went 8-2-1 to finish second in the NFL Western Division while leading the league in passing yards (2407) on offense and interceptions (33, tied with the Bears) on defense. Taking advantage of diluted competition during World War II, he continued to be the NFL’s dominant pass receiver. He retired following the 1945 season as the career leader in receptions (488), receiving yards (7991), TD receptions (99), and overall TDs (105). Many of those records lasted for decades – the one for TD receptions lasted until 1989. Used as a defensive back (rather than end) on defense, he intercepted 30 passes in his last six seasons (individual interceptions were first compiled in 1940). As a placekicker, he compiled 7 field goals and 172 extra points and his overall point total was 823, which also was the NFL career record at the time. Hutson was a consensus first-team All-Pro on eight occasions. The Packers retired his #14 and he was inducted into the Pro Football Hall of Fame as a Charter Member in 1963.